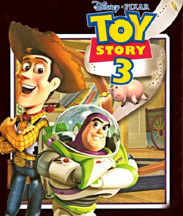 After 11 years, the wait is finally over for fans of Disney/Pixar’s Toy Story franchise with the release of Toy Story 3. It’s a sad day in the toy chest when Andy starts packing for college. Will Woody (Tom Hanks), Buzz (Tim Allen), Jessie (Joan Cusack), Mr. & Mrs. Potato Head (Don Rickles & Estelle Harris), Rex (Wallace Shawn) and the rest of the gang be taken along, relegated to the attic or kicked to the curb? The friends find themselves donated to the preschool set, where they are at the mercy of grubby, manhandling toddlers and a posse of two-faced toy bullies, led by Lot-s-Huggin (Ned Beatty) and a suave Ken doll (Michael Keaton). In true Toy Story fashion, our heroes show ingenuity, loyalty and courage as they make their exciting escape. In the end, the toys and their Andy learn to accept that while change is hard, it results in growth. The chance to share love and bring happiness to others trumps all. What makes this movie work so well across generations is its emotional intensity. Whether it’s the joyful belly laughs, the poignant drama, or the very real sense of fear – as when the toys are nearly incinerated and reach out to one another to say goodbye – the viewer is taken on an unexpectedly satisfying and cathartic journey. The fact that it’s funny, clever and full of adventure doesn’t hurt either! Toy Story 3 is rated G and opens in Disney Digital 3D on June 18. Thanks to Cyndi Menegaz for her review. Toy Story 3 is the one of the best movies I have ever seen. That is a lot coming from me. My star rating for this film is 5/5. It is hilarious, witty and absolutely charming. So, go buy your ticket today because I predict they’ll sell like hotcakes. “Ride like the wind Bullseye!” Today was my last day of school (of 6th grade). I felt trapped like next year everyone will forget me. The toys felt this way too in the movie. Remember when you go watch the movie, don’t just sit in your seat, relate. I love this movie and I hope that you do, too. Goodbye for now and see you next time on Lauren’s Critic Corner. A panel of America’s foremost children’s authors, illustrators and content experts will serve as final judges in the PBS KIDS GO! Writers Contest, a national-local contest designed to promote the advancement of children’s reading skills through hands-on, active learning. The Contest, sponsored by PBS KIDS GO! and WNED-TV Buffalo/Toronto, encourages children in grades K-3 in communities across the country to celebrate the power of creating stories and illustrations by submitting their original work. Eighty-seven (87) public television stations participated in this year’s contest, which generated over 25,000 submissions. The national Contest winners are expected to be named in July 2010. The winning stories will be posted on the Contest Web site at ReadyToLearnReading.org , alongside a message from singer-songwriter and American Idol winner Jordin Sparks about the influence of writing in her life. Other new site features allow kids to create “Story Mashups,” put together “Story Stuff Pages,” vote for their favorite stories, and use a customized search tool to explore over 1,100 kid-created stories. Presented by AFI Silverscreen Education, as a special feature of the AFI-Discovery Channel Silverdocs International Documentary Conference, SchoolDocs is an innovative strand of workshops, panel discussions and films investigating cutting edge practices in visual education directed to the needs of 21st century educators and students. 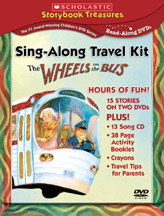 Traveling just got easier with this travel kit from Scholastic – The Wheels on the Bus…and More Musical Stories Sing Along Travel Kit. In addition to two high-quality DVDs, the kit also comes with a CD of favorite songs and a 34-page activity booklet with crayons. Sing along to The Wheels on the Bus and There Was an Old Lady Who Swallowed a Fly and learn about the importance of music in our world. Images in classic stories such as This Land is your Land, Frog Went A-Courtin’ and Giraffe’s Can’t Dance come to life through exquisite animation with gentle narration. Perfect for the preschool audience, these DVDs will get everyone singing along in the house or on the road. KIDS FIRST! Child Juror Comments: “This is good because it includes songs I was familiar with and new songs that I liked. The pictures look like a book. I like that. I think my friends would like it because they like to sing. My favorite part was in Bugs! Bugs! Bugs! when the roly poly curled up into a ball, and the spider tried to get in, but he couldn’t.” The DVDs encouraged children to ask questions such as the one child asked about what daddy long legs eat. They wanted to watch the DVDs again when they were over. DVDs and CD. 132 min. ; Ages 2-5. You are currently browsing the Granny Ranny's Coming Attractions weblog archives for June, 2010.